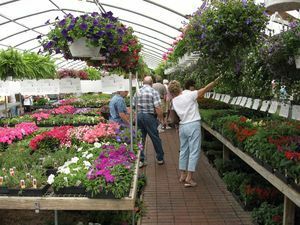 Petunias are a favorite annual of many Milmont customers. Flowers and vegetables that you replant every year. For more annuals, please see these links: Spring Bedding Plants and Flowering Hanging Baskets. Among the most adaptable of garden plants, "annuals" usually germinate, flower and die in a single year. They grow well from seed or can be started indoors and planted outdoors later. Many food plants are, or are grown as, annuals. Flowering annuals can flower quickly and provide a long season of blooms. Annuals are among the most adaptable of garden plants. The life cycle of an annual can occur from one month to several months. Summer annuals sprout, flower and die within the same spring, summer and fall. Winter Annuals tend to germinate in the fall or winter and bloom in late autumn, winter or early spring. The plants grow and bloom during the cool season when most other plants are dormant or other annuals are in seed form waiting for warmer weather to germinate. Winter annuals provide food for animals and birds, as well as vegetative cover that helps prevent soil erosion during winter and early spring. You can easily grow annuals from seed, but if you prefer to buy your plants from a garden center, look for plants that are green and preferably not, yet, in bloom. They should be neither too compact nor too spindly. For most annuals, provide locations that have well-drained soil and receive full sun (6 to 8 hours a day). Certain annuals (such as impatiens, pansies, salvia, dianthus, coleus and others) do well in part shade. Plant annuals after all danger of frost has passed. For best results, plant in the late afternoon and water well. Annuals prefer a soil pH of 6.0 to 7.4. Most annuals do not require a lot of fertilizer. Fertilizing once or twice during the growing season is generally adequate. Water your annuals at least weekly (more often in dryer conditions) with about an inch of water. Watering deeply will encourage deeper root growth. It's best not to wet the foliage itself, but if using a sprinkler, water early in the day. Some annuals, such as petunias and zinnias, are more tolerant of dry conditions. Reduce weeds and conserve soil moisture with a two to three inch layer of mulch. Your annuals will have a better chance to thrive without competition for moisture and nutrients from weeds. Deadheading (removing dead flowers) your annuals can help produce more flowers and a fuller plant. See your Milmont representative for more information about growing annuals. For a list of annuals offered at Milmont Garden Center, click the links on this page.